Hi all! I hope that my U.S. readers had a wonderful Thanksgiving. Mine was characterized by marathon cooking, baking, eating, family hugs, and full belly pats. The ensuing days have been a lazy mixture of: left-overs; a haircut for G.; double feature night Chez English on Friday ("Funny People"-thank you Judd Apatow, again, and "Angels & Demons"-meh); delivery pizza that was promised in 30 minutes and came 90 minutes later (the price of living way back in the country, I guess); Indian buffet for lunch on Saturday; completing the first chapter of the fourth book in the "Homemade Living" series, "Keeping Bees"; snuggling with my pups Dexter and Fly; having my master audio electrician older brother, Jimmy, and his wife Emily stop by to show me that one simple button on our remote had caused us to lose sound in our living room speakers for the past four months (me and G. are rather technologically inept); and lots of sleep today, for a number of reasons. In short, perfection! The third installment of my "Thirsty Homesteader" posts is about yet another beverage I often begin my days with (and yes, I am the most well hydrated woman in Western North Carolina). In addition to Kombucha and my Women's Trini-tea, I make a cup of hot tea each morning. It varies, based on what sounds good, but usually involves chai at least several times each week. Tired of the cloyingly sweet pre-packaged version, I started making my own chai some time ago. It couldn't be easier, can be sweetened to your preferences, and fills your kitchen with the most invigorating aromas. This time of year I find it especially delectable, as the spiciness of cardamom and clove seem perfectly suited to the season. Warm in the hands and warm in the belly, this chai recipe is a keeper. *You'll need to first bruise your cardamom pods before adding them to the water, in order to expose the seeds inside. I do this by hitting them with the back of a spoon. Once cracked open, place the whole thing into the pot-pod, seeds, and all! -Add water and spices to a medium-sized stainless-steel pot. Bring to a boil over high heat. -Reduce heat to low, place tea into a tea strainer, and add to pot along with honey and milk. Simmer for 5 minutes. -Remove from heat, cover, and steep for 5 minutes further. -Remove and compost tea, and pour chai into two large mugs. I like to leave the spices in, but you can discard them if you prefer. The life of a full-time stay-at-home writer living in a forest 15 miles from town can get a bit lonely at times. I have my sweet husband, whom I adore, and a host of pets to keep me company. Sometimes, though, I miss the random, unexpected, spontaneous interactions and connections with strangers that characterized my previous career as a medical assistant, or when I managed a B&B, or worked retail at a natural foods store. I miss the homemade hummus someone would bring into the office to share, or the quirky Brit who was lodging with her 82 year-old brother, or spotting Weird Al Yankovic and Downtown Julie Brown at my place of employment. I know, right? Who wouldn't miss THAT? Imagine then, the untold delight I encounter meeting and connecting with new friends via this blog. Imagine what it feels like when those encounters become a bit closer; those encounters that are of the third kind where, you know, we make contact. So goes my connection to Cyn over at River Dog Prints. Cyn originally contacted me this past summer, to let me know she was cross-posting one of my Small Measure Can-Do contest giveaways. Though she didn't win that contest, she did score big on a later one, for my Fig & Thyme Jam. True lady of graciousness and talent that she is, Cyn kicked up the gratitude volume full-blast and mailed me not just a lovingly written thank you note (and there's no way she could know how much I like the color brown-she's in Connecticut, I'm here in N.C.), but she crafted the most fantastic labels for adoring home-canned goods! Thank you so very much, Cyn! What a treat! And what a perfect segue into the holiday that is all about gratitude and thankfulness and connecting sincerely and mindfully with those in our lives. Have a wonderful holiday everyone! I'm thankful for each and every one of you. Because he amuses us with things like this. I call this one "Piggy in Repose." Like I said in my last post, I'm a creature of habit. The last thing I do every night before rubbing a bit of calming herbal salve on my temples (a heavenly gift made by my dear buddy Wendy that smells like every sweet thing you've ever smelled) is make sure Dexter (my wild 1 1/2 year-old Black Lab mix) is on the bed with me, gift him a good belly rub, and a kiss on the head, and then turn out the light. Each and every night, this is what goes down before I shut down. Come daybreak, after I've downed the cranberry/kombucha/mineral water tonic, I fire up the gas stove and put on a kettle of water. When it spits and sputters and whistles its merry tune, I pour the boiling water into a large, ceramic mug into which I have placed a tea ball containing dried red clover, red raspberry, and nettle leaves. Two tablespoons of each of the herbs are left to steep, covered by a lid (I use a little ceramic Japanese dish turned upside down), for 2-4 hours. Red clover, red raspberry leaf, and nettles have long and storied reputations as balancing herbs for women. Having experienced a long and storied history of my own with women's health issues, I've found this blend to be highly efficacious in terms of regulating cycles, supplying iron, and just relaxing me overall. Also, since I began this regimen (over one year ago), the mid-day crash I used to experience almost every afternoon has completely disappeared. Unless I actually had a poor night's sleep the night prior, I never get tired during the day anymore. I also suffer very few of the seasonal allergy symptoms I used to fall victim to, thanks to the inclusion of nettles, nature's anti-histamine. Pretty potent stuff. Admittedly, it tastes a bit like drinking grass. At least it did in the beginning to me. Now it tastes fresh and green and clean and slightly sweet. I love it. It's my mid-day go-to thirst quencher. I sip on it throughout the day, after I've finished my morning tea (more on that forthcoming...). If you're interested in trying it out, consult your health care provider for any possible contraindications first, especially if you are pregnant. Since I knew I wanted to drink this for some time, I ordered 1-lb. bags of each of the three herbs. If you'd like to just try it out before committing to three full pounds, pick up about 1-2 ounces of each from a local herb supplier or from Mountain Rose Herbs. Oh, and, of course, I'm no medical professional. Just a lady who loves the power of plants, coupled with the power of healthy routines! I like the comfort of routine. As soon as I wake each morning, without fail, I stumble into the bathroom and brush my teeth. I let the chickens out, feed the cats, give the dogs a little breakfast, and pour myself a glass of homemade kombucha with cranberry juice and mineral water. When I am home, this is what occurs each and every morning. The routine grounds me, establishes my bearings, and sets my course for the day. My adventures in kombucha home-brewing came after purchasing one too many jars of the pricey, albeit delicious, Synergy Gingerberry kombucha beverages. I decided then and there that I could make kombucha at home, I just needed a S.C.O.B.Y. (Symbiotic Colony of Bacteria & Yeasts), aka the "mother culture". Kombucha is a tonic beverage, rife with enzymes, probiotics, amino acids, antioxidants and a host of other beneficial nutrients. It's been consumed around the world for centuries, making its way west in the past few decades and into the larger cultural landscape over the last few years. Kombucha works on the blood, liver, and digestive system, balancing ph levels, increasing metabolic function, and helping in detoxification. Composed of water, black tea, sugar and the mother culture, this tonic beverage can be made at home for considerably less cost than incurred purchasing it pre-made. Admittedly, kombucha's sensory properties make it the sort of beverage only a "mother" could love. Reminiscent of old beer and vinegar and looking like a slab of human skin suspended in a murky solution, overcoming the olfactory and visual impact of kombucha is a bit daunting in the beginning. It's sour and puckery and fizzy all at once. I find it sublime. I pour out about 1/3 c. into a large pint-sized glass, add about 3 Tbsp. unsweetened cranberry juice (to support kidney and bladder health), and top everything off with sparkling mineral water. I have friends who like their kombucha straight, though. Everyone finds their preferred means of imbibing the twangy elixir and customizes it accordingly. It's your thing, do what you wanna do, right? If you've never tried kombucha before, I invite you to give it a go. Perhaps purchase a bottle first, to determine if the flavor is one which you enjoy. If so, follow the recipe below and start brewing S.C.O.B.Y. snacks yourself. Before you know it, kombucha might just become part of your morning ritual, as well! *If you are fortunate enough to source a S.C.O.B.Y. from a nearby friend, you'll need a sterilized glass jar with a lid for transporting it home. Don't use plastic, as food debris or flavors trapped inside the plastic can compromise your culture and starter liquid. 1) Bring 3 quarts of water to a low boil; add the sugar. Stir until completely dissolved. 2) Remove from heat, add tea bags and steep for 15 mintues. 3) Remove tea bags and allow the tea to cool to room temperature. 4) Pour the tea into a large, sterilized glass container (I use a square glass canister found at a home goods store). 5) Add the starter liquid. Place the culture on top of the tea, with the more shiny side facing upwards. 6) Place a folded up kitchen cloth or napkin over the top and secure it on firmly with a rubberband or string. 7) Transfer the container to a dark, room temperature area (I use my pantry). Allow to culture for 2-3 weeks, depending on how intense of a flavor you desire (longer culturing time results in a more sour, carbonated kombucha, my preference!). 8) When ready, transfer most of the kombucha to a lidded container and store in the refrigerator. Keep the mother in the culturing container, along with at least 1/2 c. liquid. Begin another batch of tea, cool, and add to the culturing container. Continue doing this for a constant supply of kombucha. *Over time, your mother culture will begin producing "babies," visible secondary layers. Remove those layers and give to friends. Otherwise, you'll need to add them to the compost pile, in order for the mother to remain strong and viable. In the photos above, I'm clearly due for adopting out some babies! Hello all! Glad to be back! I was at my mom's house for the good part of this week, helping her as she recovered from her second knee surgery. She only has dial-up internet connectivity, which is murder when you're trying to get internet-based writing done. I headed out to the adorable, super-friendly, free-trade/organic-coffee-serving coffee shop in her tiny mountain town of Burnsville, NC to write up my Small Measures with Ashley post that is up today over at Design Sponge. It's about expressing and practicing gratitude, something I try to keep ever-present in my thoughts. It's easy to be grateful for the good things that come down the pipe in life. It's harder to be appreciative of the challenges-the driver who cuts you off, the mean person working at the deli you frequent, the terse nurse at the hospital. I once read a bumper sticker that read "Bless them, change me." Words to live by. Have a lovely weekend! Congratulations to D. An, over at Homesteader Wanna-be! She's the lucky winner for this month's Small Measure Can-Do giveaway. And just in time for Thanksgiving! Lucky you! Thank you to all who participated. Next month I'll be back with another temptation! Look for the next delicacy to be posted here November 30 (I've opted to start December's contest a week early, otherwise, I'd be shipping out the prize the week of Christmas and everyone's usually got a bit too much going on right around then). 'Til next time! So, it turns out that small measure has won an award! 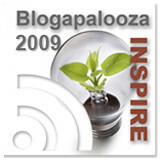 This humble labor of love was recently named "Most Inspirational Local Blog" at the annual BlogAsheville awards. I'm delighted beyond words. The core idea behind Small Measure is that making environmentally sensible lifestyle choices need not be daunting. There are simple, daily gestures individuals can take to benefit themselves, their families, their communities, and the planet as a whole. With small measure I strive to chronicle the triumphs, attempts, and challenges experienced in my attempt at living with deliberate awareness of the world around me, offering tidbits of seasoned wisdom and advice for others along the way. The fact that others have decided to come along for the ride, and found inspiration en route, is more than I could have ever hoped for. THANK YOU! 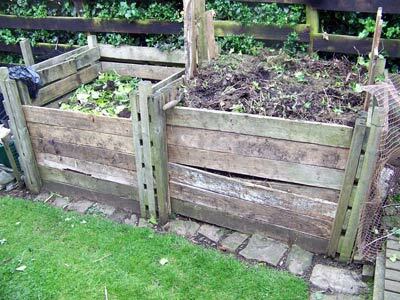 Why toss out yard waste and kitchen scraps when you can turn them into nutrient-rich, vital compost? Come check out my "Small Measures with Ashley" post this week over at Design Sponge where I discuss different composting options, methods, and troubleshooting tips. It's been a whirlwind week, wrapping up the third book in the "Homemade Living" series, "Home Dairy"; helping my mom get through a second knee replacement surgery (she's on the mend, just in lots of pain-thank you intense pain killers! 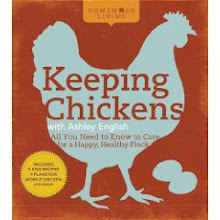 ); meeting with my dynamic marketing and publicity team to discuss promotion ideas for books 1 & 2, "Keeping Chickens" and "Canning & Preserving"; and just generally holding down the English fort. Best wishes to all for a healthy, relaxing weekend. I know I could use one! It's raining buckets outside (courtesy of Ida-my fruit trees send you a big "THANK YOU"); my mom is laid up in the hospital following a second (!!!) knee replacement surgery in 5 months; my chickens are molting and look pathetic; and my editor, my publisher's publicist, and another marketing crew member are coming over in a few hours to film some promotional videos for the "Homemade Living" series. I'm scrambling. What better thing, then, to sit down and talk about in the midst of this madness than shoes? Makes no sense whatsoever, I know, but I've been meaning to mention this ecologically-minded shoe company ever since I discovered it shoe-shopping with my sister several weeks ago. I figured, when you're stumped for blog topics with millions of other things to do, it's time to roll out the shoe shout-out. * The foot bed on the interior of the shoe is a soft fabric made with bamboo charcoal – also biodegradable and offering one of nature’s most effective anti bacterial and anti odorants! By manufacturing shoes in an environmentally friendly manner and making sustainable business decisions, Groundhog Footwear has created a line of green shoes anyone would be proud to walk in. Best of all, they're crazy stylish. I've got my eye on the Beth boots (which I found for considerably less money at Asheville's beloved Discount Shoes). Do you know of other eco-friendly shoes that successfully marry conscientious construction with design? I'd love to hear about them. We all really love the wood stove. Hi everyone! My post on "Getting In the Spirit: Domestic Liquor" is up over at Design Sponge. Come find me over there and tell me your favorite homegrown (or homespun) libation! I wanted to send a big, hearty WELCOME and a digital hug to all of the new readers. So glad to have you on board. Also, I've wanted to apologize for the short and/or scanty postings lately. 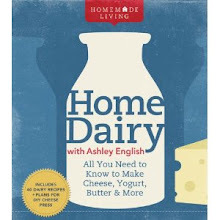 The deadline on my 3rd book in the "Homemade Living" series, "Home Dairy," is this coming Monday. It's been nothing short of dairy madness around the English casa over the past few weeks. My refrigerator is bursting at the seams with 7 types of cheese, while two hard rounds are aging in the basement, with 3 more to come over the weekend! Once that settles down, and my mom has her second knee replacement surgery on Monday, I should have a bit of breathing room, albeit short-lived. 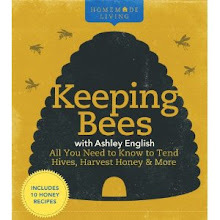 The writing of the 4th book, "Keeping Bees", commences shortly after that. I love it, though, all the writing, all the cooking and stirring and planning and thinking. Winter is actually an exceptionally good time to pen a book, in my opinion. There's little to do outside, a grand husband who lovingly cooks meals of a divine nature for me and gives my tense shoulders a good rub, a cozy wood stove to write in front of, lots of warm creatures vying for my lap, and hot tea to warm the soul (and fingers!). I hope your weekend is filled with all of your favorite things. Mine will be defined by fromage! Oh, and don't forget, you can also find me on Twitter. This maple is the one of the last to turn. It's a welcome sight, given that all the other trees have cast off their leaves in shameless abandonment. I can see it from the kitchen window, where I sit writing, a mug of hot chai in hand, wood stove a 'blazing, a sleek black kitty to my right. It's the first Monday of the month. Around here, that can mean only one, momentous thing: it's time again for another Small Measure Giveaway! 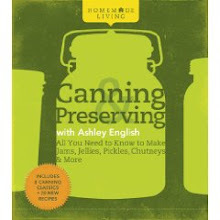 For those of you new to the contest, or to this blog, I'm staging a giveaway each month from now until the release of my book, Homemade Living: Canning & Preserving with Ashley English. Each month one lucky person will win an artfully crafted canned item featured in the book and made by yours truly. From my pantry to yours, this month I'll be giving away a jar of Cranberry, Juniper & Rosemary Sauce. Could there be anything more appropriate, for my U.S. readers, than a cranberry giveaway for November? Guaranteed to festoon your table in time for Thanksgiving, this blend of tart berries, aromatic juniper and fragrant rosemary will perfectly compliment turkey and turkey-free tables alike. 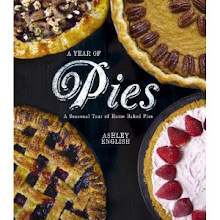 And the day after the big feast, it's the perfect companion to turkey sandwiches, sweet potatoes and sauteed greens. It's even a great foil for balancing the sweetness of pecan pie! To enter: Simply leave a comment to THIS specific post by telling me your favorite way of cooking or serving cranberries. Your comment MUST link to your particular blog or web site (and therefore to your contact information) or include your e-mail address. Otherwise, I won't be able to get in touch with you if you win! Any entries that do not include some way of getting in touch will be disqualified. Deadline: Comments must be received by midnight EST November 16th, 2009. Odds of winning will depend on the number of eligible entries received.